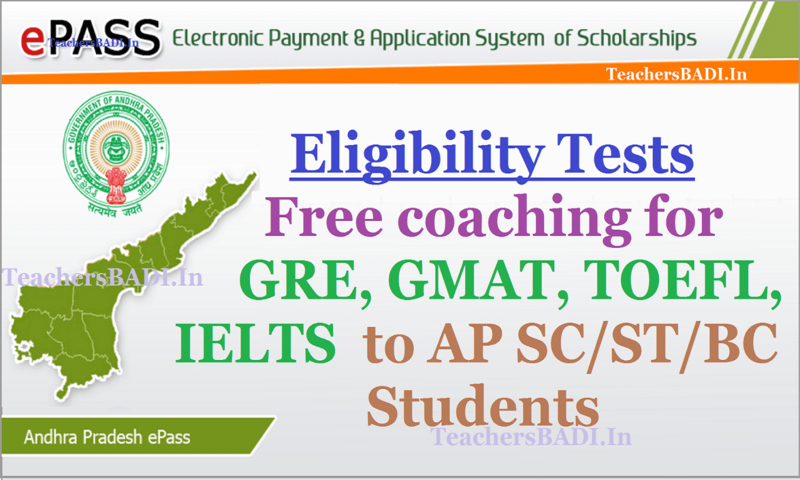 The Department of Social Welfare/Tribal Welfare/BC Welfare, Government of Andhra Pradesh has issued the Free coaching to SC/ST/BC students notification and applications are inviting from the eligible candidates through online portal https://apepass.cgg.gov.in/ for the admissions into coaching classes for GRE(Graduate Record Examinations, GMAT(Graduate Management Admission Test), TOEFL(Test of English as A Foreign Language Testing System) and IELTS(International Language Testing System). The candidates should be from SC / ST/BC community and the annual income of the parents / guardians should be less than Rs. 2 lakhs. Interested candidates can start applying online from 16th February 2017. Last date for the registrations for the first batch is 28th February, 2017. The coaching will be offered in selected institutions. Candidates can submit online applications through APePass website only. The scheme is intended to provide skill upgradation for the poor students in the state of AP. The list of eligible and shortlisted candidates for the programmes is also available on the ePASS website.